Choose DCC Corporation's HOTMUX Temperature Data Logger. 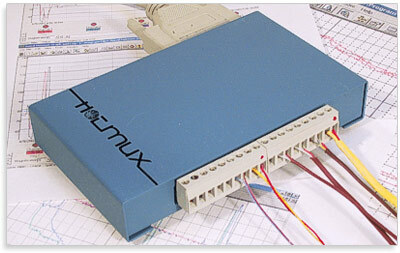 The HotMux system is particularly designed to monitor thermocouple and other analog signals using digitizing eight channel modules and to display, print, and store data via an attached desk or laptop computer. 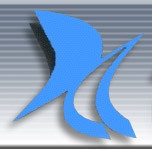 The modular HotMux hardware, combined with Windows (R) compatible application software results in a versatile, accurate, reliable, cost effective solution, where multi-channel sensor information must be monitored, saved, reported, analyzed or passed on to third party application software. * PROCESS MONITORING. The HotMux is being used successfully in industries such as food processing, manufacturing, printing, metallurgy, etc. where critical process variables (temperature, pressure, etc.) may particularly affect the results of the process. Continuous monitoring records the process, and user-defined alarm limits immediately alert the operator to out of range conditions that require attention. * QUALITY CONTROL. Lamp ballast manufacturers have been using the HotMux in testing the temperature rise in the casing and ensuring UL certification. Oven manufacturers test their ovens to ensure proper temperature gradients throughout the chamber. Another application includes the measurement of operating temperatures of chain saw mufflers, ensuring safety against injury and fire. The HotMux is used to check the temperatures in bread-making machines, guaranteeing consistency in product quality. * FIELD TESTING. Manufacturers of printed circuit board production equipment use the HotMux with portable PCs to periodically test existing installations and verify the proper adjustment of their systems. Experimental agricultural stations have used the HotMux to make long-term studies of soil temperature and its effect on plant growth. A unique field-testing application belongs to a power company that checks the moisture content of coal, which affects its weight at time of purchase and therefore the price they pay. * ENVIRONMENTAL MONITORING. The HotMux has been used to study the effectiveness of a water treatment plant by making before and after studies of key factors such as turbidity. The HotMux may also be used in remote weather station locations where the data can be transmitted with a modem to a central monitoring station. In matters of the environment, the flexibility, and portability of the system are evident and well appreciated. * RESEARCH AND DEVELOPMENT. The HotMux is found in laboratories where product performance monitoring is essential such as in automotive engine tests, as well as climate and comfort zone controllers. A chemical firm uses the HotMux to record temperatures of element samples undergoing GC analysis. In another application, a structural engineering department is characterizing the effect of temperature on material strength and elasticity. * MANUFACTURING. From process control, to product quality evaluation, to packaging or the pasteurizing of food related products, the importance of continuous monitoring of critical process variables is evident. The HotMux is a cost effective tool that simplifies the task of monitoring, reporting and analyzing such data while making the process easy to understand and control. In manufacturing applications, the HotMux contributes to maintaining high quality standards and improved efficiencies. Capture and display sensor data at low cost with your PC, using DCC Corporation's HotMux Thermocouple Scanner and Data Logger. Copyright 2017 DCC Corporation. All Rights Reserved.